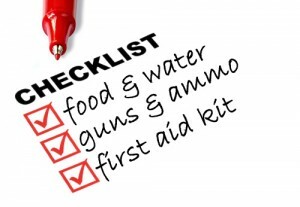 Surprisingly, despite all the nights you’ve spent awake mentally preparing for the apocalypse, there are almost certainly things you’ve forgotten to take into account. Today we’ll deal with the most commonly forgotten elements of end times preparation. Because once the plumes of ash are rising into the stratosphere you don’t want to remember you’ve left your Breathe Right strips in your glovebox (outside the safety perimeter). 7.) Weather stripping: I can’t stress how important this simple task is. Granolas and “Herm the Thermwise guy” have been telling you to do this for years now and you’re still putting it off. But as the toxic fog that turns you inside out creeps through the cracks around your rattling windows you’ll be wishing you hadn’t. 6.) hidden rooms: you’ve always wanted to. Now you have the excuse. Just tell your spouse or significant other that the new secret compartments are for epic games of hide and seek. When roving gangs of marauders pass you by unscathed, he or she will thank you. 5.) underground propane tank and/or photovoltaic panels: This one is a bit more spendy, but unless you’re planning to go mobil it’s a must. Make sure you keep some spare parts and a generator lying around as well. 4.) vacuum seal dry goods: I don’t know about you, but the day I run out of tea is the day I lose the will to live. Maybe you prefer a cup of joe. Well, I hate to break it to you, but Starbucks will almost certainly become mutant headquarters in cities around North America. A vacuum sealer can be used to keep frozen meat and tons of other stuff. Everyone thinks of canning, but people all too often forget to vacuum. 3.) Puzzles, paperbacks and card games: Soon after Armageddon hits, my iPad’s going to become a doorstop. And what else will there be to do when not scraping tooth and nail for survival? A good ole’ puzzle or a game of strip cribbage, that’s what. 2.) Sunscreen: You won’t be laughing as your skin sloughs off in sheets due to the earth’s failing ozone layer and intensified UV rays. Sure, eventually you’ll develop a healthy red glow, but until then lather up — 38 sun protection factor at least. 1.) a sling and/or bow and arrows: everyone thinks to go for a gun when the end comes. But few realize that a trusty bow or sling can be just as deadly when used proficiently. Plus, it is less likely that your weapons will be stolen or used against you. While guns draw a crowd, arrows and stones are quiet. When bullets run out, you’ll be wishing you could simply pick up 5 smooth stones to slay the giant.